We are presenting excellent quality assortment of Vacuum Dryer. Vacuum dryer removes water or moisture from any product with the heat produced within the temperature set. Vacuum dring allow drying to proceed at a reasonable rate. This process is commonly done to preserve food products, or preparing dehydrated products. Capacity: 50 Litres to 15, 000 Litres. 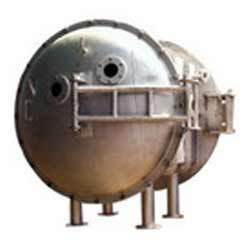 SMR Pharma Equipments provides a comprehensive assortment of Rotary Double Cone Vacuum Dryer GMP Model, fabricated from high grade of raw materials. We offer Rotary Double Cone Vacuum Dryer GMP Model at very economical price.